This part and the relevant data were published in . A summary of the most significant findings is presented below. 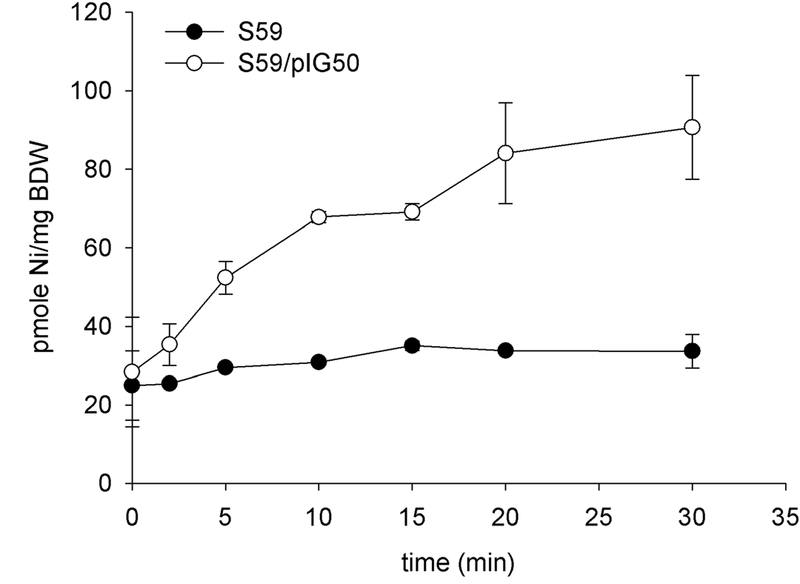 A nikA E. coli MG1655 strain (S59) was compared to the same strain transformed with a plasmid containing K1404001 (pIG50). NikA is the main endogeneous nickel intake protein in E. coli, and it could have interfered with the measurement, which is the reason we inactivated it. Moreover, the experiment was performed in the presence of an excess of magnesium, to avoid nonspecific Ni2+ uptake by magnesium transporters. The strains were cultured in LB medium to an OD600 of 0.6, at which time 150 nM 63NiCl2 was added. The cells were recovered after 0, 2.5, 5, 10, 15, 20 and 30 minutes of contact by filtration using a nitrocellulose filter. The filter was washed twice with EDTA in order to eliminate all extracellular nickel. The captured nickel was estimated by measuring the radioactivity of the filter. Data represent the mean of 2 replicates, and error bars represent standard deviations. While the intracellular nickel remains nearly constant at 25 pmol Ni/mg BDW (Bacterial Dry Weight) in S59, the addition of the K1404002 allows the cells to accumulate up to 90 pmol Ni/mg BDW (6 µg/g BDW). Equilibrium seems to be attained after 30 mn. This result shows that this part is efficient at increasing the bacterial intracellular levels of Ni2+. Duprey A, Chansavang V, Fremion F, Gonthier C, Louis Y, Lejeune P, Springer F, Desjardin V, Rodrigue A, Dorel C: “NiCo Buster”: engineering E. coli for fast and efficient capture of cobalt and nickel. J Biol Eng 2014, 8:19.